We've printed all sorts of creative wedding newspapers over the years, but as far as we know this is the first one that comes with a pair of 3D glasses. 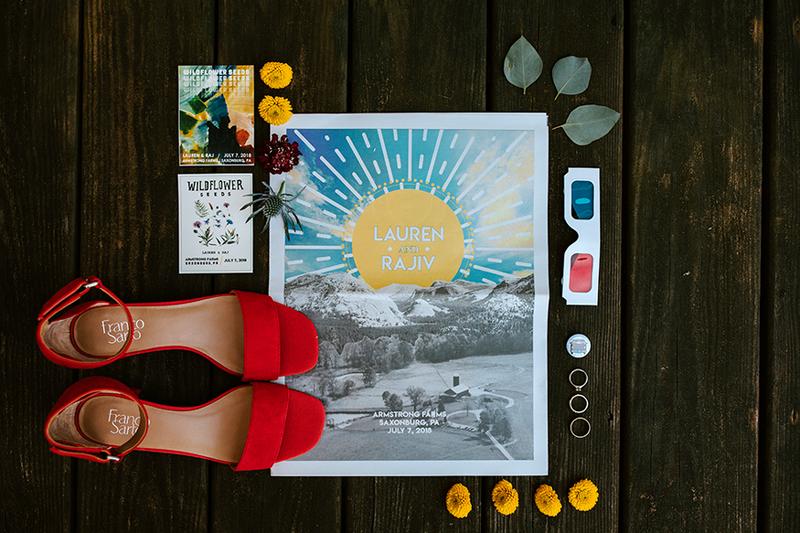 Lauren and Raj were married on a farm in Pennsylvania this July, and used a digital tabloid to share their story—which includes a year-long road trip in a van named Voz—with family and friends. 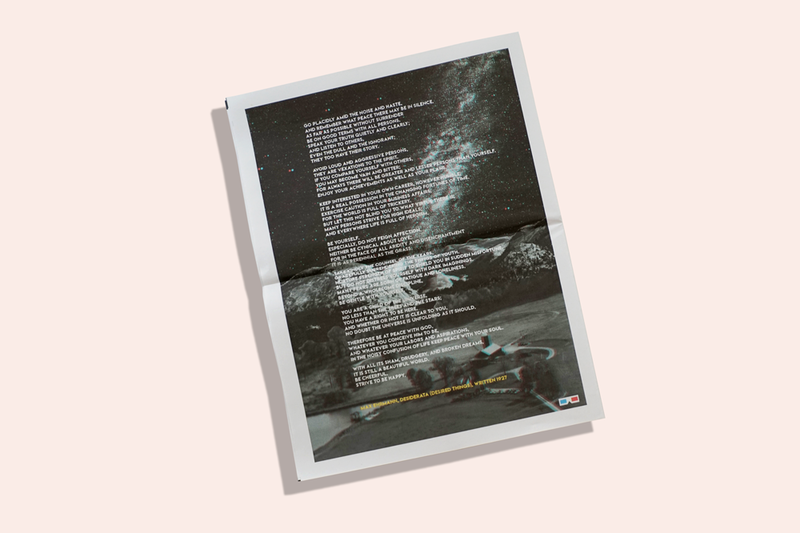 In their own words, they walk us through the process of making the newspaper, from interviewing their folks for a "Meet the Parents" spread to turning a poem they love into a 3D keepsake (guests wearing glasses made for some great photographs, too). Lauren and Raj on their wedding day in July 2018. The design of our wedding program was rooted in a desire to bring our friends and families together. Being a multicultural wedding, we wanted to invite guests to learn more about our traditions, our families, and us. What started as a simple idea evolved into one of our most cherished pieces of memorabilia from our wedding. By the day of our wedding, we had known each other for 14 years and had been together for 7. Our journey had been long and full of adventures, but we realized that not every guest knew about these details. We dug through our closet for keepsakes from our many years of friendship-turned-relationship and created a page with the stories behind these objects. 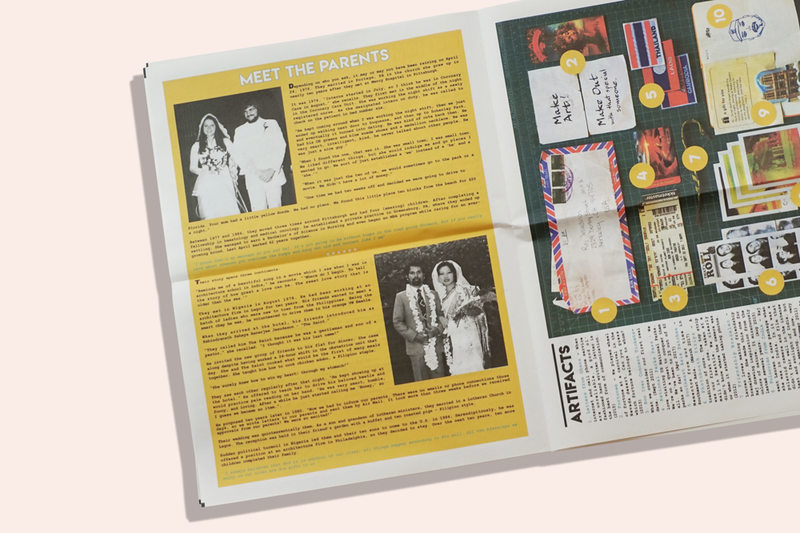 Spreads from Lauren and Raj's wedding newspaper, telling the stories of how their parents met and showing objects important to the couple. We also dedicated a few pages of the program to our parents’ stories. These pages were some of our favorite to create—we connected with our parents in new ways by interviewing them about how they met. We designed and arranged most of the newspaper in Microsoft PowerPoint—you’d be surprised what this simple software can do! We set up the pages as slides with dimensions according to Newspaper Club guidelines. We used “draft” slides to sandbox ideas and quickly pull and paste favorite elements into a “publish” slide. If the “publish” slide took a wrong turn, we just duplicated the slide and created a new iteration. This method created a useful page history to pull material from easily. 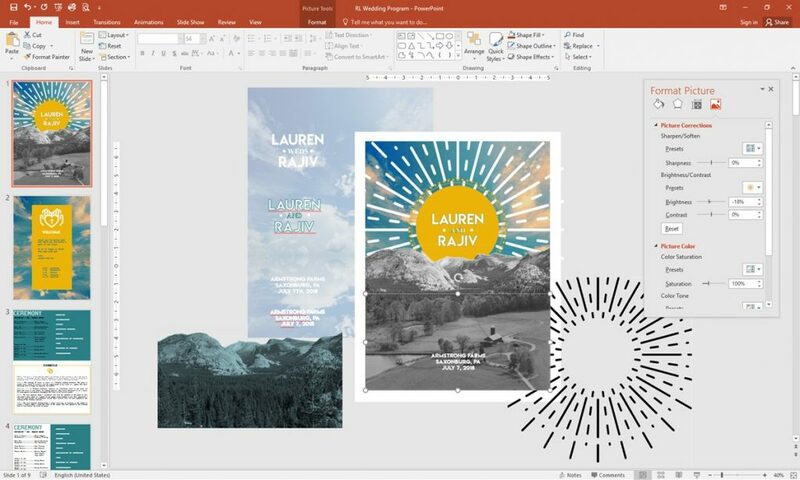 A "draft slide" Lauren and Raj used to design their wedding newspaper in Microsoft PowerPoint. We exported the PowerPoint slide deck as a PDF, opened the files in GIMP (a free alternative to Adobe Photoshop) and re-saved to 300dpi as per Newspaper Club guidelines. We didn’t worry about converting colours—since we were printing digitally, we left the RGB to CMYK conversion to Newspaper Club. We’re sure there is a more elegant way to do this with other software, but we went with what we knew and we were very pleased with how it turned out! 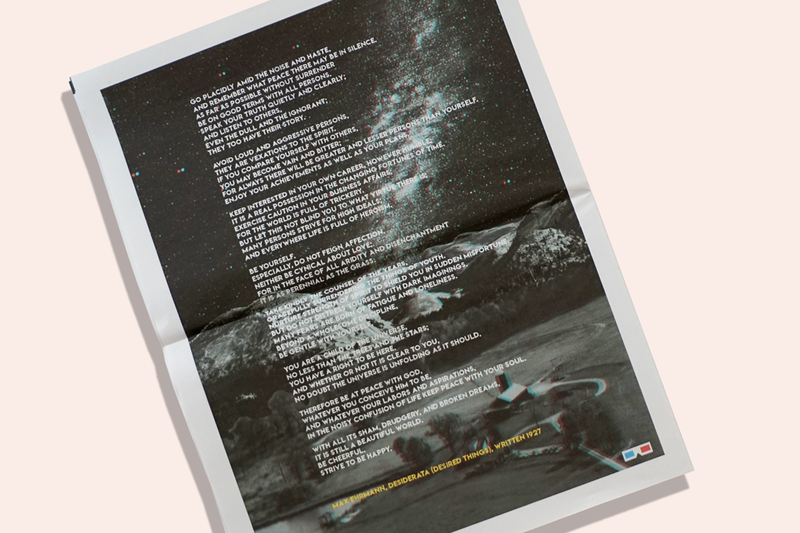 Back page of Lauren and Raj's newspaper, featuring the poem "Desired Things" by Max Ehrmann printed in 3D. Before getting engaged, we took an almost year-long sabbatical. 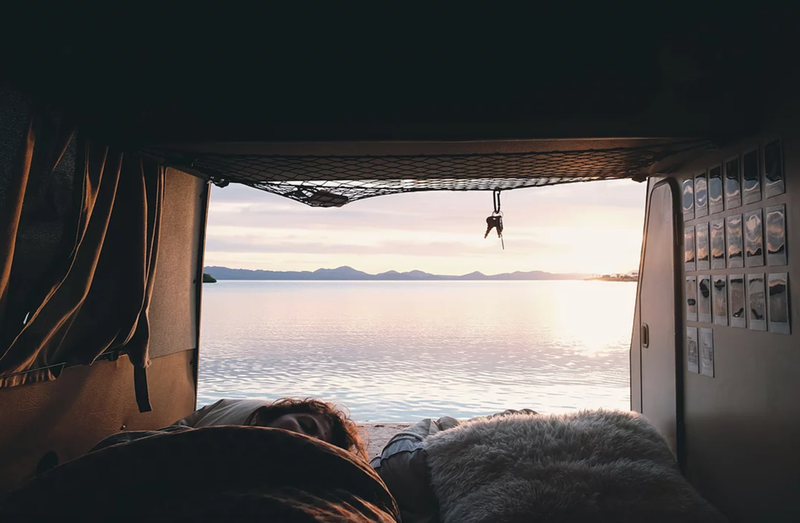 We dropped it all, got in our ‘86 VW van and headed for Mexico. Towards the end of our journey, we found ourselves in a cabin in Idaho. As we were settling in, we spotted a poem framed on the wall—it was "Desired Things" by Max Ehrmann. We stood there reading it in awe as it beautifully captured our hopes for our future as we wrapped up our trip. The view from Voz the Van. The moment and the words stayed with us. More than a year later, when we had the opportunity to design a newspaper for our wedding, we wanted to feature the poem on the last page. We hoped the words would linger in our guests’ minds as they did in ours. We added a 3D effect to make the words appear even more magical. Following a 3D Anaglyph tutorial we found online, we created the back page image of our newspaper (show above) using GIMP. Lauren and Raj turned a favorite poem into a 3D image using an online tutorial. A picture with layered depth works best, so we created an image merging Pennsylvania farmland in the foreground with a California mountain range in the background—an homage to our homes, old and new. We found that it was important to increase the contrast of the isolated blue and red channels to make the image pop. Setting them against a fairly dark grayscale background also helped increase the 3D effect. One of Lauren's favorite moments from the wedding was seeing her dad reading to her niece, who was wearing 3D glasses. One of Lauren's favorite memories from the wedding (aside from our sacred union, of course) was watching her dad reading the poem to her 8-year-old niece, his granddaughter, while she is wearing 3D glasses. He was casually sitting on the porch, with Lauren's niece listening and looking attentively. The 3D poem couldn't have made a more perfect moment. 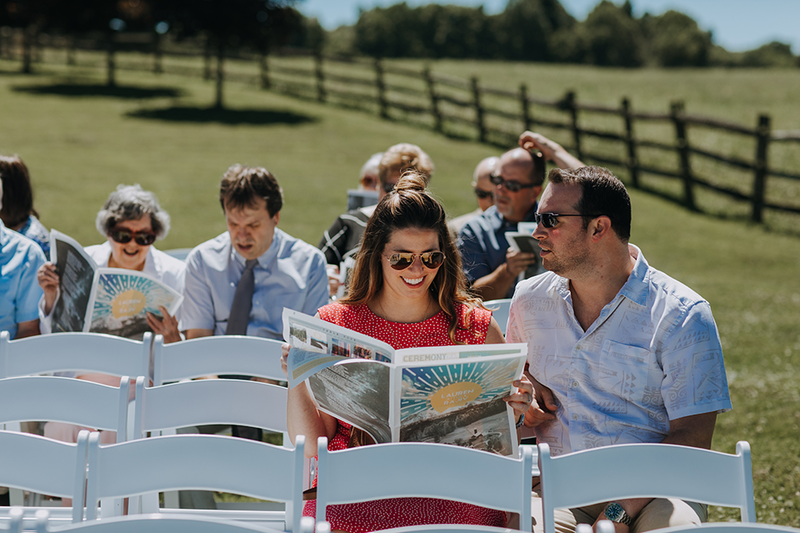 Guests enjoying the newspapers before the ceremony at a farm in Pennsylvania. 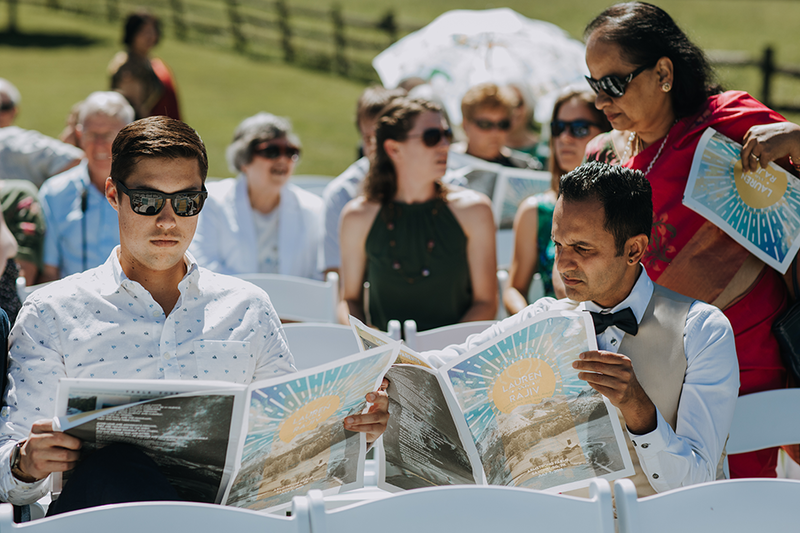 Guests were invited to grab a newspaper as they took their seat at the ceremony, which wove together Indian, Filipino, and Christian wedding traditions. We wanted people to be able to read about the cultural significance of each tradition before the ceremony began. Guests could read more about Lauren and Raj's story, and see a layout of the dinner tables, in their newspaper before the wedding. Having the programs at the start of the wedding allowed guests to also see the day’s schedule, read stories about us and our parents, and bone up on their dance moves while they waited for the ceremony to begin. Kids loved the 3D page! Guests also appreciated the table tour page—dinner tables were named after our favorite places we’ve traveled and we used this page to add some context. 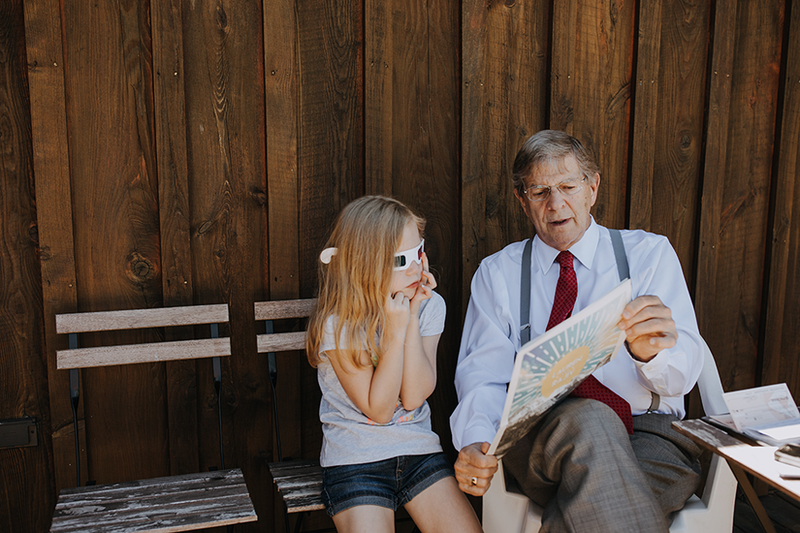 We like to think that one day our children will flip through the newspaper and learn about their parents and grandparents—and how cool we used to be! Photographs from the wedding by Dana Ratica of All Heart Photo and Video.